Buenos Aires is experiencing unusually cold weather (it even managed to drop into the 30s F on our first night) and yet last week it was just as hot here as it was in Spain, I miss those lovely 80-90 (F) degree days! We will be eating out often in Buenos Aires because the grocery stores have been pretty disappointing, especially Jumbo in the Palermo district. We have already checked out the Carrefour Market, Carrefour Express, a few nearby local supermercados along with the aforementioned Jumbo. All of these stores so far carry very similar items. There’s not a whole lot that set apart one store from the next, unlike our experience with the different grocery stores in Spain. Nearly every store we have been into carries frozen Milanesa de Soja (Breaded Soy Schnitzel) and occasionally a few have had veggie burger patties. Milanesa de Soja seems to be a pretty common product in the frozen food section, but not all brands are vegan, actually some of them aren’t even vegetarian! I don’t understand why a company would make a breaded soy patty and then proceed to fill it with real ham and cheese. In most stores the Milanese de Soja is the only soy product available, and we have yet to come across soy milk in any store. We are already discovering that to eat as well as we did in Spain, we are going to have work a little harder and spend a little more money. At this point, what this means for us is that we will be eating out more and venturing further to check out Chinatown along with a few specialty shops. It also means that we will devote more time to finding the local artisanal products and visiting the Farmers’ markets. Here are the last few vegan grocery items we’ve tried in Valencia, Spain. 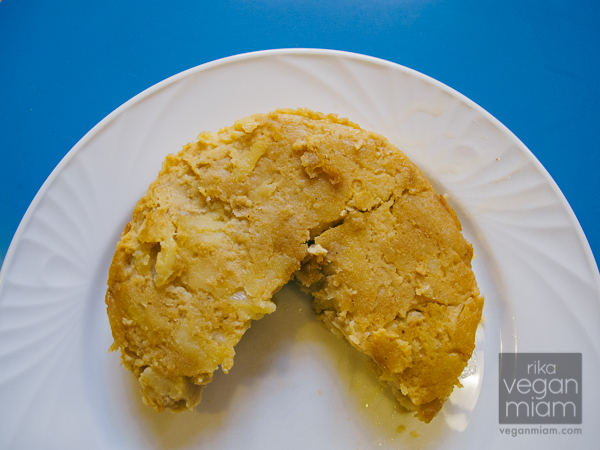 We tried a vegan, organic and gluten-free tortilla de patata sin huevo & sin cebolla by a Spanish brand, SoriaNatural. It is a very thick potato omelet made without eggs and onions and it is different than a Latin American tortilla. 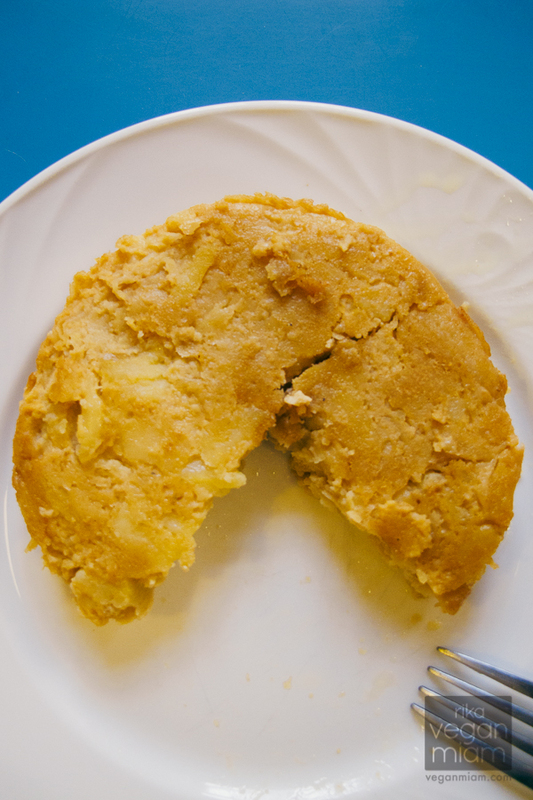 Traditionally, tortilla de patata is a thick and salty omelette/cake made of fried potatoes, onions and eggs. The tortilla may be eaten hot or cold; it is commonly served as a tapa, pie style (triangle) portions (pincho de tortilla), meal, sandwich filling, or typical snack throughout Spain. Tortilla de patata: It is also known as Tortilla Espanola or Spanish Omelet. 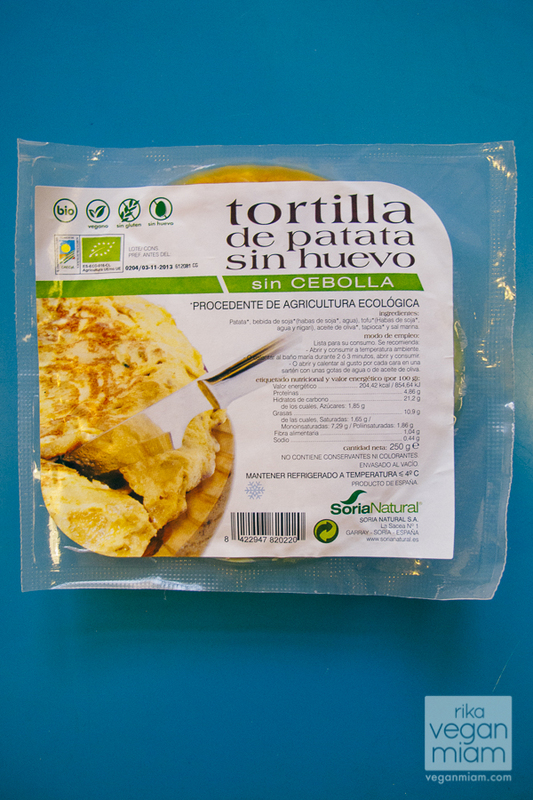 The brand SoriaNatural has two types of vegan tortillas: with or without onions. The SoriaNatural tortilla de patata products are available at supermarket Carrefour in Valencia, Spain. Tortilla de patata: Pour 1 Tbsp. of olive oil or few drops of water into a small, non-stick frying pan and heat on medium heat. Allow the tortilla to cook around the edges, then carefully lift up one side of the tortilla to check if it has slightly browned. Or you can also consume it at room temperature. We personally like our tortilla de patata slightly browned. It is pretty tasty without the onions or additional salt or other seasonings. I wish I can eat it all. 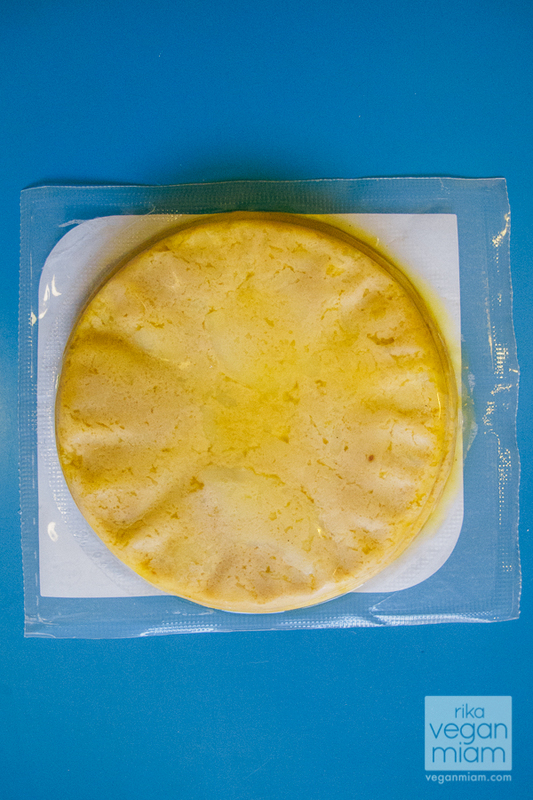 Tortilla de patata: The product’s ingredients are potatoes, soymilk (soy beans, water), tofu (soybeans, water and nigari), olive oil, tapioca and sea salt. 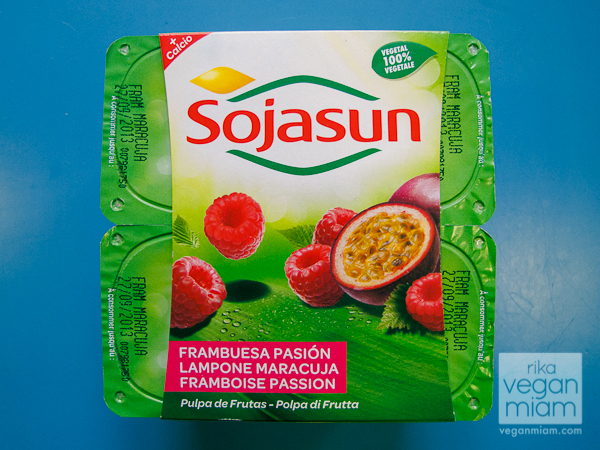 Bought two packs of Sojasun raspberry-passion fruit yogurts. 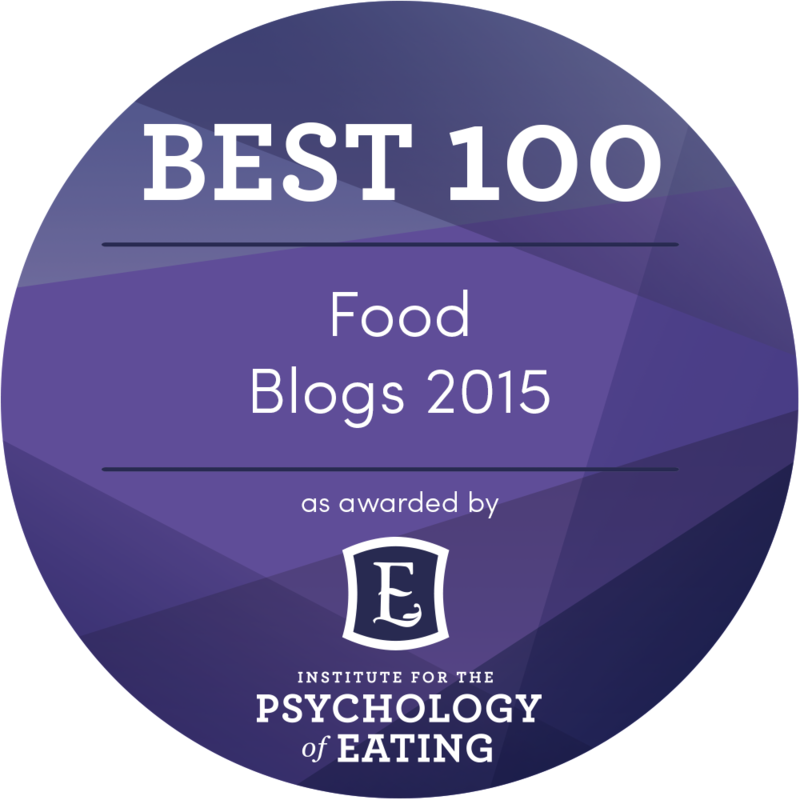 They are 100% vegan and gluten-free, and they use GMO-free soya. It has a raspberry flavor, but not the passion fruit. Sojasun is a French brand. They are pretty tasty and great for digestion. I love their yogurt selections. Ingredients: soya drink 78% (water, soya beans 9%), sugar, raspberry 8,2%, passion fruit juice 2,2%, calcium phosphate, thickeners: pectin – locust bean gum, concentrated elderberry juice, natural flavouring, concentrated lemon juice and selected live cultures. 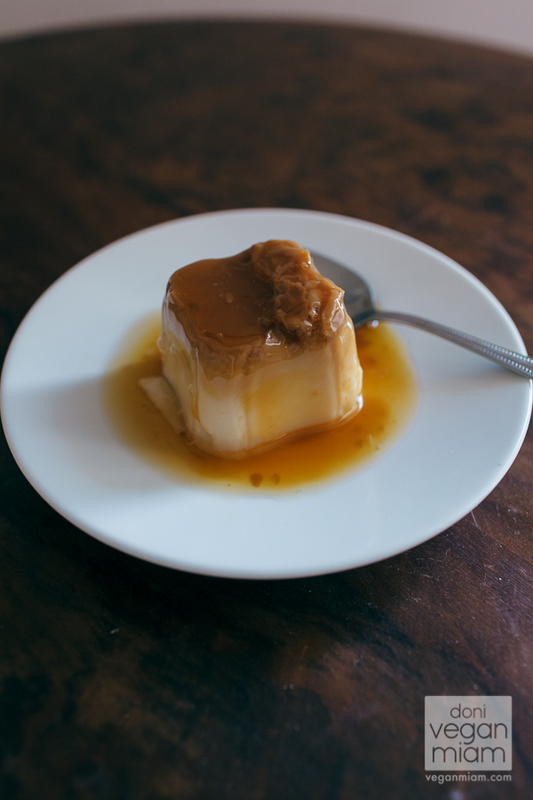 Vegan vanilla flan with caramel also by Sojasun. It comes in four individual serving cups. SO yummy – it never fails to impress! 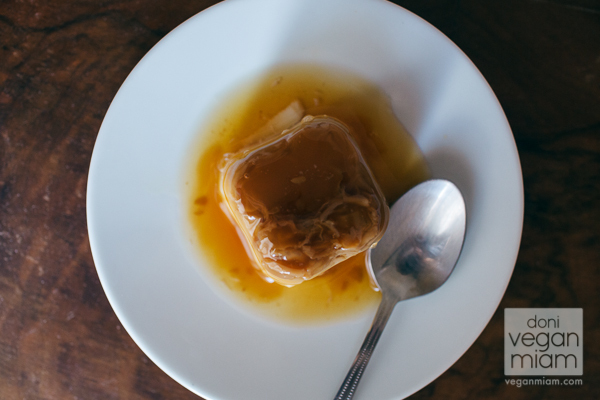 Have you ever had made vegan omelets or flans before? What is your favorite yogurt flavor – do you like soy, almond, coconut or rice based yogurts? have you ever been to a supermarket full of items loaded with artificial additives & flavorings?